Watch Live from our nest cam! 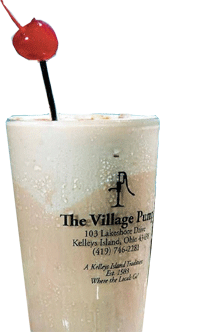 The Village Pump has been the destination watering hole for boaters and visitors alike since 1983. Specialties include the 'famous' Brandy Alexander and Lake Erie perch deliciously prepared by Pump chefs. We feature an full bar and dining service March through December! The Village Pump was the first High Speed Internet Cafe on Kelleys Island, as we are committed to keeping up with your wants and needs. You are able to bring your electronics in and check your email or browse the internet. Copyright© 2019 All trademarks, graphics, and images are privately owned by The Village Pump and for promotional uses only. For all inquires concerning website, contact WEBMASTER.